I will cover below topic in this blog . Add a vCenter to a Data Center before using that vCenter to create a private cloud environment. 1- On the left pane, click Data Centers and click Manage Data Centers. 2 -On the page, click Manage vCenters. 4- Enter the Host Name in the form of a fully qualified domain name. Note You must have administrative privileges to use vCenter. 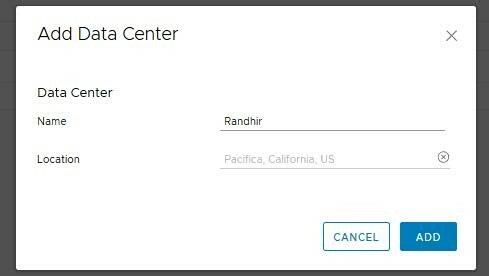 5 -Enter the User Name and Password for the vCenter server. 6- Select the vCenter Type. Consolidated Management and Workload: Is a vCenter type, where both VMware SDDC Suite products and payload VMs are managed together. vCenter Type selection is currently used only for classification; the setting has no associated product functionality.